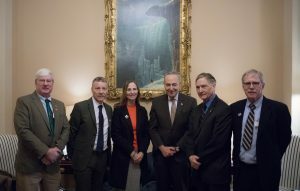 On Thursday, November 15, 2018, Senate Minority Leader Chuck Schumer met with Ms. Carmel Quinn, sister of Ballymurphy victim John Laverty. Mr. Laverty was killed in an incident called the “Ballymurphy Massacre” that occurred at the start of British government’s policy of internment without trial in Northern Ireland. Over the course of three days, members of the British Army’s Parachute Regiment killed 11 unarmed civilians. Besides Ms. Quinn’s brother among the victims were a Catholic Priest and a 45 year old mother of eight. Ms. Quinn and the families of the victims have been seeking accountability for these unwarranted deaths for the past 47 years, an inquest into the killing has only recently convened.